This 1st Grade project was on perspective, the closer an object is the larger and closer to the bottom of the page it is and the further away the object is the small and closer to the top of the page. You’ll notice that the class got the idea. I’ve included a web address that gives a simple lesson on drawing frogs. The expressions on the faces of the frogs are so cute. No special supplies needed, just crayons and a black Sharpie. More information about the “Frogs on Lily Pads” can be found in the 1st Grade Projects Gallery in the sidebar. 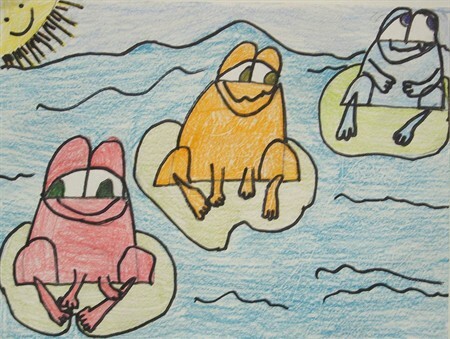 This entry was posted in 1st Grade and tagged 1st grade, art projects for kids, arts and crafts for kids, easy learn to draw a frog, frog art for kids, frogs on lily pads, how to draw a frog, perspective. Bookmark the permalink.